Andrew Rea from the popular YouTube series, Binging with Babish, helps us celebrate the adventures of summer with a collection of delicious recipes paired with Diamond Collection wines. 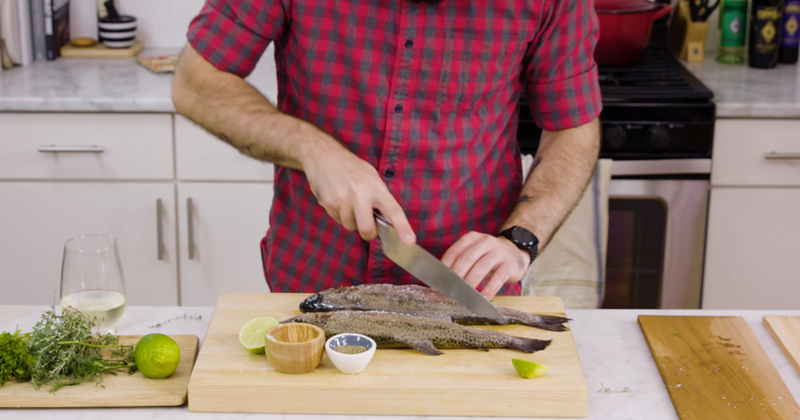 In this episode, Andrew prepares a delightfully simple Rainbow Trout paired with Diamond Collection Pinot Grigio. Get the full recipe below. Preheat the oven to 450 degrees. Line a rimmed baking sheet with parchment paper. Make diagonal slashes on both sides of the fish. Place the fish on the prepared baking sheet. Season the fish with salt and pepper on both sides and in the inside cavity as well. Stuff the cavity of the fish with the slices of lemon, garlic, onion and herbs. Rub the olive oil over the top surface of both fish. Roast the fish in the preheated oven for 10-15 minutes. Turn on the broiler and roast the fish for another 5-7 minutes, until golden and slightly charred in some places. Serve the fish whole, with a bit more olive oil and some freshly squeezed lemon juice.